Also writes under the pen names Daniel Moran, Jackson Lowry and Karl Lassiter. one of the staff writers for the Jake Logan Slocum series. Robert E. Vardeman discusses His works. 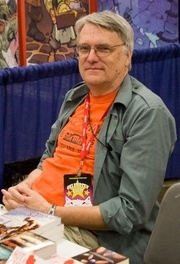 Robert E. Vardeman is currently considered a "single author." If one or more works are by a distinct, homonymous authors, go ahead and split the author. Robert E. Vardeman is composed of 13 names. You can examine and separate out names.